Three employees of the National Insurance Board recently received the NIB Director’s Award in recognition of their outstanding contributions to the progress and success of the organization in 2010. Patrick Ward, Chairman of NIB and Algernon Cargill, Director of NIB presented the Director’s Award to Pandora Butler, Public Relations Officer, Gregory Collie, Senior Manager of Compliance and Tami Francis, Manager of the National Prescription Drug Plan, during NIB’s recent Leadership Conference. Mr. Cargill said these persons have contributed to the strategic changes being made at the National Insurance Board including a focus on performance drivers and improvements to customer service. The first recipient, Pandora Butler, a nineteen year veteran of the organization was praised for going to great lengths to ensure that customer complaints are resolved and they are satisfied and happy with NIB’s service. ‘It is our job as stewards of the National Insurance Board to ensure that customers leave feeling better than when they came in, and in my mind one person that I can count on to ensure that every customer complaint I refer to them is resolved and they go to the end of the world, literally, to delight their customers is Ms. Pandora Butler,” Mr. Cargill said. In addition to improvements in customer service Mr. Cargill said the National Insurance Board has seen major advancements in the area of compliance owing to its centralization of the compliance team under one leader in 2009. ‘Results have been unbelievable in terms of the efficiency gains, in terms of the revenue collection enhancement that we have for the National Insurance Board…it takes a lot of guts, it takes a lot of stamina, it takes lot of endurance to ensure that the National Insurance Board improved its collection of revenue from $160 million to $167 million,” Mr. Cargill said of the leadership provided by Mr. Greg Collie. As for the third recipient of the NIB Director’s Award Mr. Cargill said Tami Francis’ leadership roles in the introduction of the Unemployment Benefit and the National Prescription Drug Plan are a great example of how a person can grow and develop when provided with the opportunity. “We provided the opportunity in terms of two major changes we’ve introduced at the National Insurance Board, and back then the individual who was selected had the education but didn’t have the experience, but when they got in they dug as deep as they could, as fast as they could and now they’re impressing the entire nation with the services that they’ve delivering...if it was not for Tami on September 20th we would not have been able to launch the National Prescription Drug Plan because she’s led every single area of this initiative and she’s still leading it.,” Mr. Cargill said. In addition to managing the National Prescription Drug Plan for the past year Mrs. Francis served as Senior Assistant Manager of NIB’s Unemployment Benefit Unit from April 2009 until January 2010. She holds a Master of Science Degree in Actuarial Science from the University of Lausanne in Switzerland. TAMI FRANCIS RECEIVES NIB DIRECTOR’S AWARD -- Pictured from left to right: Algernon Cargill, Director, National Insurance Board (NIB); Tami Francis, Manager, National Prescription Drug Plan, NIB; and Patrick Ward, Chairman, NIB. 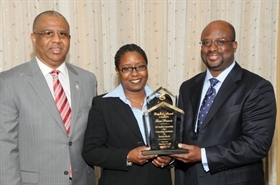 PANDORA BUTLER RECEIVES NIB DIRECTOR’S AWARD --- Pictured from left to right: Algernon Cargill, Director, National Insurance Board (NIB); Pandora Butler, Public Relations Officer, NIB; and Patrick Ward, Chairman, NIB. GREGORY COLLIE RECEIVES NIB DIRECTOR’S AWARD -- Pictured from left to right: Algernon Cargill, Director, National Insurance Board (NIB); Gregory Collie, Senior Manager, Compliance, NIB; and Patrick Ward, Chairman, NIB.